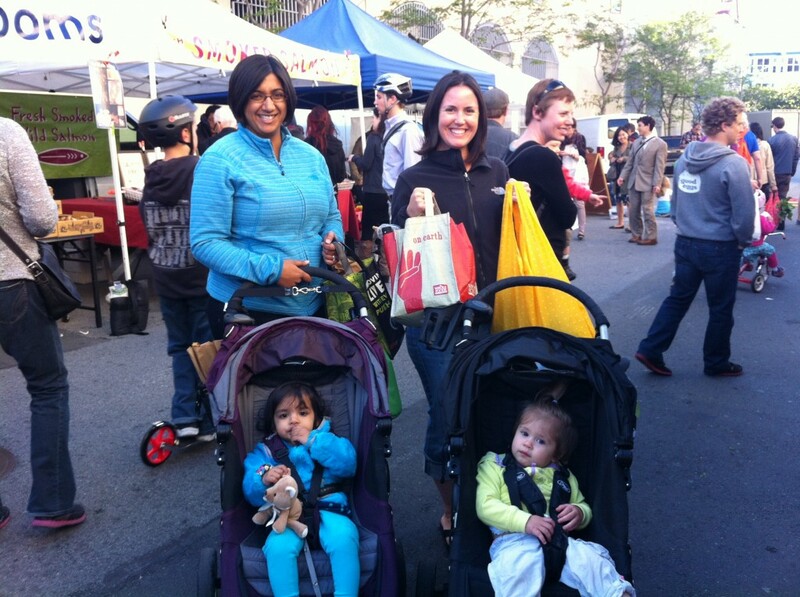 People of MCM: Shalini, Jen, and their babes! Meet Shalini & Misha (left) and Jen & Ada (right), who live three doors down from each other, and just a couple blocks away from MCM! Fun Fact: They became good friends after their daughters were born – on the same day! Where do you live? In the Mission. How often do you come to the MCM? Every week! What are you buying? Baked goods from Arizmendi, oranges from Twin Girls, mushrooms from Far West Fungi, veggies from Nyia Yi Farms (celery, ginger, mint & beets), and olive oil from Terra Savia. And we’ll probably go to Roli Roti. What’s your favorite part of the market? Location, location, location. I like that it’s walkable from the house. You can bring your kid, it’s very child-friendly. What’s the best kept secret at MCM, or something you would like people to know about? Roli Roti is amazing. I love that you can pick up dinner. You can get a meal for everyone in the family, and then also shop for groceries. 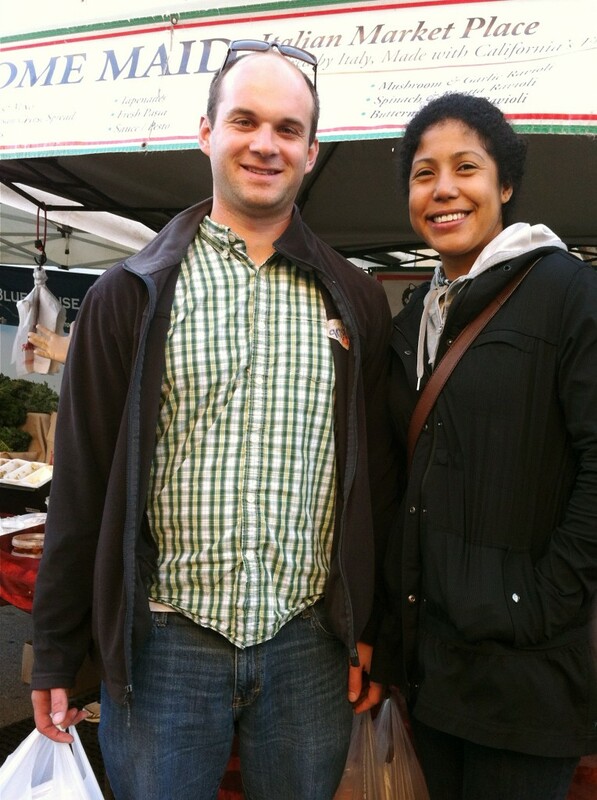 Meet Ane and Luke, who are newcomers to the area, but are excited to have the MCM in their backyard! Where do you live? In the Mission, we moved here about a month ago. How often do you come to the MCM? We have tried to come to the market every week since we’ve been here. I [Ane] get excited about Thursdays! What are you buying? Today, we’ve bought pasta from Home Maid, oranges from Twin Girls, apples from K & J Orchards, kale from Blue House, and Broncha cheese from Achadinha Cheese Company. What’s your favorite part of the market? It depends! I think it’s exciting to be able to get something to eat here, like a 4505 Meats burger, there’s something to crave. But, everything here is special in it’s own way, so I can’t just choose one! What’s the best-kept secret at MCM, or something you would like people to know about? We want people to know about it! When Luke walked past and realized that the market was here, we both came back the same day to shop. People should come check it out because it’s good…. and try everything! Every week, we pick something different and get it. This week, we’re going to eat the apples and cheese together. People of MCM: A New Feature! We’re excited to bring a new feature to our blog this week! MCM staff will be highlighting a person of MCM every week–it might be a shopper at the market, a volunteer, or even a vendor! We want our whole community to know about the awesome people that make MCM what it is. Who knows–we might snag you while you’re shopping and make you famous on our blog! How often do you come to the MCM? I just moved to the neighborhood, so I’m trying to come to the market as much as possible. I want to get all my produce here because I’m not able to go to other farmer’s markets. What are you buying? 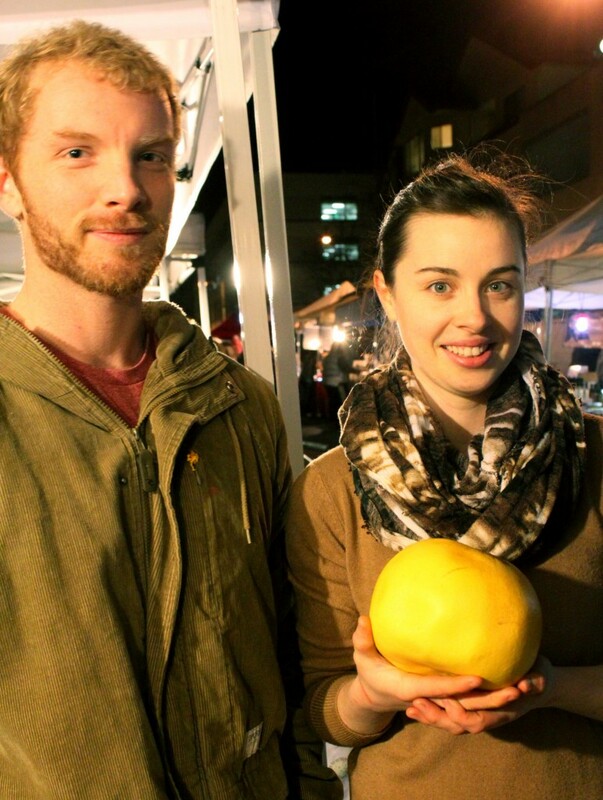 I’ve got this pommelo from Twin Girls Farm (pictured), and I’ll get some veggies at Blue House Farm, and then stop by 4505 Meats to see what’s good today. What’s your favorite part of the market? Eating Peter’s Kettle Corn! What’s the best kept secret at MCM? The market itself! 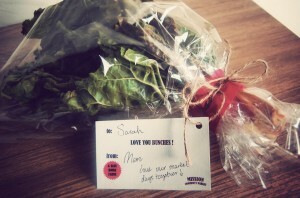 Don’t be a last-minute Valentine’s Day shopper this year! Come on down to MCM this Thursday for a special appearance from Dandelion Chocolate and pick up some of their delicious handmade chocolate bars for your sweetie. They’ll be at MCM this week for a special appearance–they’ll be back this spring on a more regular basis. Also at MCM this week, support your local food producer and MCM by pre-ordering Valentines for your honey at our 22nd Street info table! Fruit and vegetable valentines will be $3 each and the sweets will be $5 each. 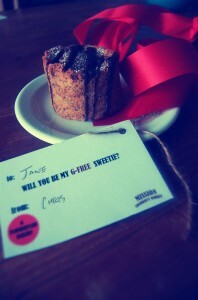 Pre-order one of these tasty Valentines at MCM this week (2/7) for pickup at the market next Thursday–Valentine’s Day! This weather is un-real, so this afternoon I decided to “chill out” with some fresh frozen yogurt made with ingredients from Twin Girls Farm. Its a super simple recipe so while you’re at the market tomorrow grab some fruits and make some fro-yo for the big game on sunday! 1. 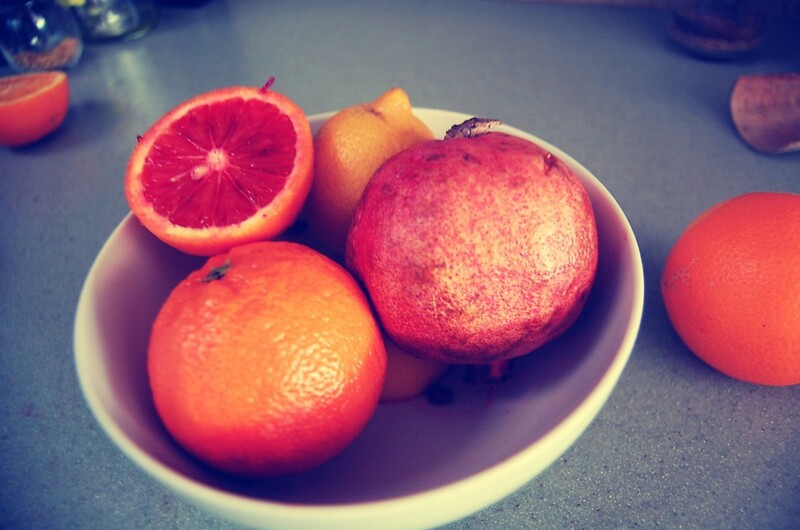 Juice orange and lemon. 2. 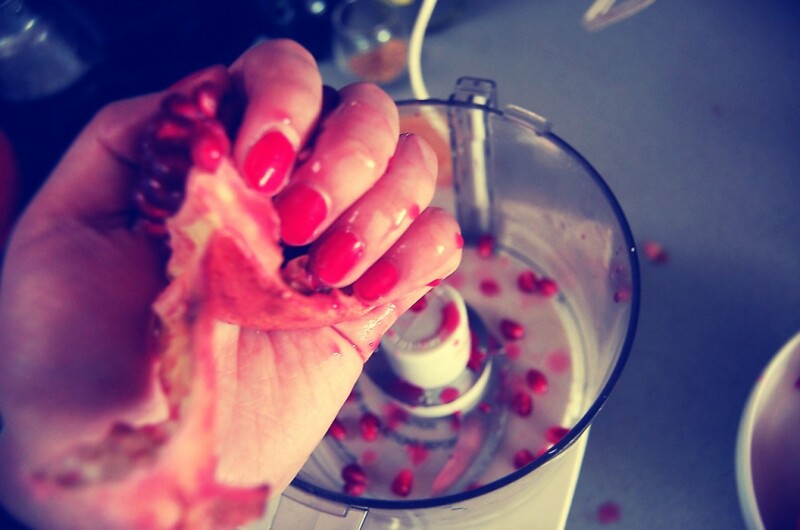 Put the seeds of one pomegranate in the food processor. 3. 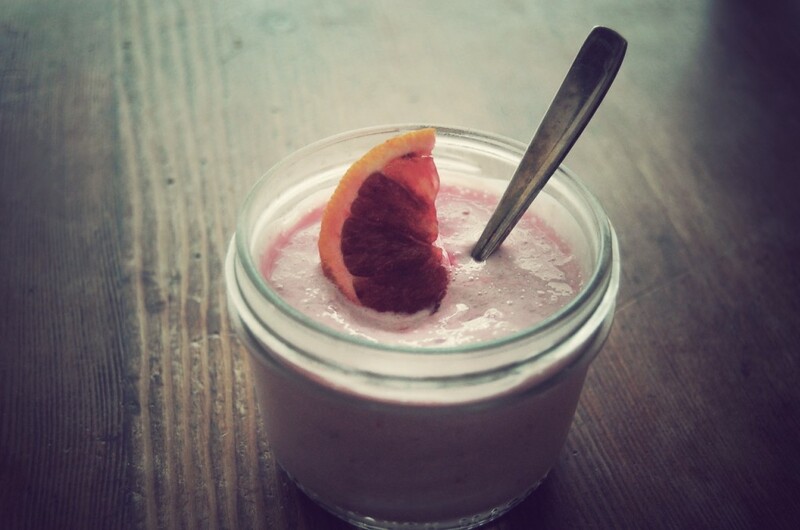 Add juice and yogurt, and vanilla and sweetener.